I gave birth 16 months ago, and even though I have shed most, if not all of my pregnancy weight thanks to breastfeeding and my active toddler (I’m sorry to inform that there wasn’t any special diet), I am still plagued with excess abdominal fat from childbirth. Everyone has his or her own beauty standards and while I’ve absolutely nothing against a mum bod, I just wasn’t used to the excess fat as my abdomen was as flat as a washboard prior to pregnancy, even without much exercise. Fortunately, I found out through Dr Terence Tan from Halley Medical Aesthetics that CoolSculpting, a non-surgical, non-invasive, no downtime fat reduction treatment, is able to effectively address my issue. 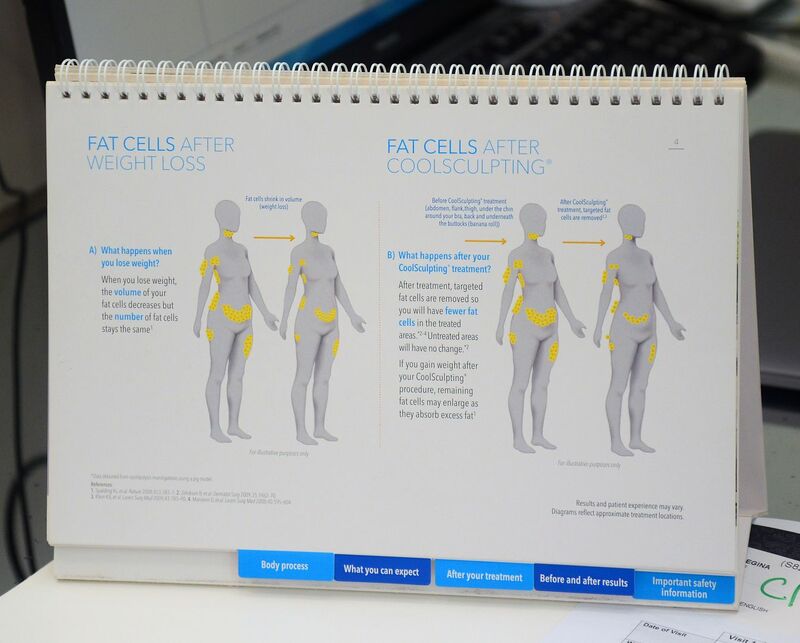 Now, CoolSculpting is the only US FDA-approved fat freezing treatment that employs the concept of cryolipolysis to freeze and destroy unwanted fat cells, which are then disposed from the body naturally. Not only does it remove 20-25% of fat cells in the area treated, the effects are permanent as our body is unable to produce more fat cells after the age of five. Yes, say bye to those fat cells forever! It targets stubborn, unwanted fats in selected areas such as the abdomen, love handles, inner and outer thighs, arms, bra fat, knees, and even the double chin area. If you’ve stubborn fat in specific parts of your body and exercise has proved futile thus far, perhaps CoolSculpting is the answer you’ve been looking for. After Dr Terence Tan explained what CoolSculpting is all about, I felt completely assured to go ahead with the treatment. He gave a thorough explanation with utmost professionalism and even showed me some before and after photos of the Coolsculpting treatment, which put me at ease instantly. His candour and friendly demeanour made decision-making even easier on my part. Dr Terence Tan prescribed four CoolAdvantage applicators to treat the bulging stubborn fat on my abdomen. 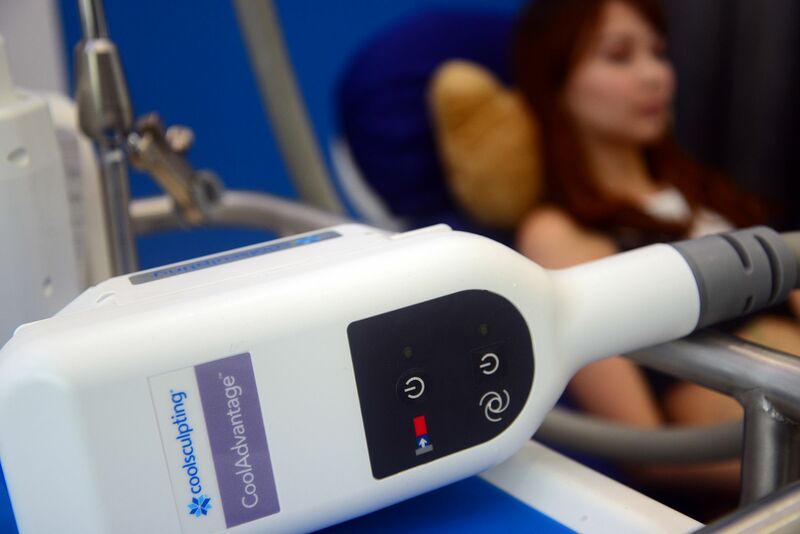 In comparison with legacy CoolSculpting applicators, the CoolAdvantage range of applicators reduces treatment time by nearly half depending on the type of applicator used. Instead of the usual 60 mins with the traditional legacy applicator, treatment time is dramatically reduced to just 35mins with the CoolAdvantage Plus applicator! This new range of applicators also boasts an enhanced cup design for better comfort as well as a larger cooling area to treat a bigger surface area. Halley Medical Aesthetics offers DualSculpting too, which is the use of two CoolSculpting machines in tandem to reduce treatment time by half. By marrying the latest fat reduction technology with smart slimming strategies, Halley Medical Aesthetics aims to make it easier and quicker for anyone to achieve their body goals. What about the treatment process? Dr Terence Tan first used the CoolAdvantage templates to mark out the areas that required treatment. The clinic assistant then applied gel pads onto the treatment area to protect the skin during treatment. I had my treatment done in 2 sessions as I had to be home to tend to Rhapsody but all in all, the total four-applicator session took just 2hr 20 min to complete as compared to the 4 hr it would have taken if legacy applicators were used. The process was very comfortable and only got better with time. When the applicator was first placed on the treated area, I was initially a little taken aback by the coldness and gentle tugging, but it took my body not more than 10 minutes to adjust to the treatment. Before long, I was using my phone and chatting with the staff. At the end of each treatment cycle, the clinic assistant removed the applicator and massaged the treated area. This helps to break down the crystallised dead fat cells, which will be passed out by the body naturally. How did I feel after treatment? Was it effective? I experienced some temporary redness, numbness and a tingling sensation that resembled mild stomach cramps on the treatment site, all of which hit me on and off for about 2 weeks. Nonetheless, these minor side effects weren’t disruptive to my daily routine at all. Although the final results will only show up after 3 months and it has only been a month since I’ve received treatment, I can already attest that my abdomen is less bulgy and more toned. For your reference, here’s a side profile of my before photo just to give you a glimpse of how much abdomen fat I had prior to treatment. Can’t wait to show you guys the final look at the third month mark! None of the photos in this post have been edited or filtered, so it’s as real as it gets! Here’s a video to see what I went through during the CoolSculpting treatment with Dr Terence Tan at Halley Medical Aesthetics.